This mod was already released in the Ubermod, but it was never released as a stand-alone mod until now. The push mod is a Team Deathmatch (TDM) only game type in which both teams fight to gain ground and push their way across the map to score. As you fight your way through each map, your team's spawn will move forward depending on who can reach each checkpoint. The checkpoints are not marked. In order for a team's spawn to advance, one player on that team must make it to the next checkpoint. Allies head towards the sparks. The sparks indicate the score zone for allies. Axis head towards the smoke. The smoke indicates the score zone for the axis. That, or you can incorporate the settings in the push.cfg file into your server.cfg file if this is the only mod you want to run. This mod should not conflict with any existing mod on your server unless you are running customized single player multi-player maps that this mod uses. 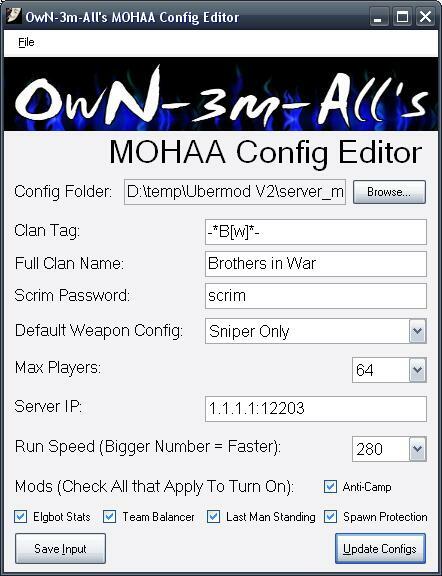 Configure which mods run by default using MOHAA Config Generator. New anti-camp and spawn protection mods added to the framework! Added new hit points mod that works by giving you a half a point if you hit a player and cause over 40 damage with a shot that does not kill him. Additional cvars and email settings have been added. Backup and remove all currently installed mods to avoid conflicts. This mod contains all of the server fixes and everything you could possibly need. It should be the only mod running on the server. It includes the weapons limiter mod, so there's your weapons mod. The config folder should be set to the current directory of all the configs. However, if you want to use the config generator for other configs, click the “Browse...” button and pick a folder where you have config files. It is recommended not to change this! When you’ve finished setting your server’s desired settings, click on “Save Input” and then click on “Update Configs”. Go back to the previous directory where you see the mod, configs folder, and server.cfg. Edit the server.cfg to set your defaults (rcon password and stuff). This is the only config file you’ll need to edit manually. Save your changes and close your text editor. The above entry gives the test user full rights to the server using a login of test and a password of test. server’s operating system to the server’s MOHAAMAIN directory. Start the server. Your server is now running the Ubermod. Move the files in the local_modmain directory to your local PC’s MOHAAMAIN directory. When you join your server, press F11 to setup the menu’s key bindings. The MOHAAConfigGenerator application works on all Windows versions. Sorry, but there is no Linux version. Other mods are created by their respected authors. The admin menu is a variant of the menu released by Merlin. Elgbot clientside files which add unreal tournament sounds when playing FFA in my servers.